Lebohang Kompi has more than 10 years experience in the development of appropriate use of ICTs in Education as well as advancement of Astronomy and applied Physics (Astrophysics) is Sesotho context (AstroSesotho), development of models for Girls in Science as well as teaching of Mathematics and Science at Secondary. This led to the development of newLGCSE Publications Beyond2010, where he published newLGCSE Physics Beyond2010 textbooks. 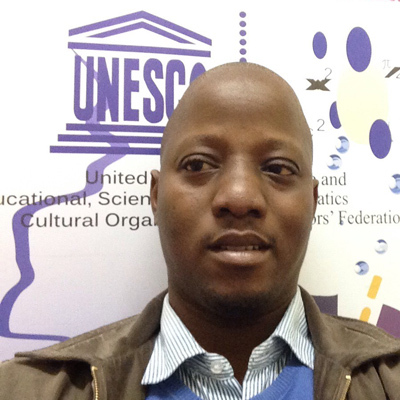 He worked at the Lesotho National Commission for UNESCO (UNESCOM) from 2008 as an independent volunteer in Science and Education, where he pioneered several models and headed various Participation Programmes (PP) for Maths and Science Educational Development. He later developed a firm that specializes in Science Education Consultancy Industry through the commercialization of the ThakaKhoali Living Laboratory Approach. This technology enthusiast started his career as a software engineer in India. For the past 8 years, he has worked for international clients with several software firms in India and Southern Africa. He also got involved with several projects related to education. Manu enjoyed coordinated several Science and Technology Conferences organized by his schools, and he is now focusing on empower with an organization in his home town of Alapuzha, India. In addition to several computer certifications, Manu holds a Master's Degree in Computer Application from the University of Calicut, India, a Bachelor's degree in Physics from the University of Kerala, India. Mpho wears several hats: from knowledge management & policy Analyst all the way to social and cultural entrepreneur, community facilitator, innovator and blogger. Founder of the GEM Institute, a community-driven platform to connect policy and practice. Mpho is passionate about arts, design & technology, innovation, entrepreneurship and change. She believes in the strong connections between STEM and STEAM (as in Science, Technology, Entrepreneurship, Arts & Media). For her, STEAM and coding skills are powerful enablers for youth to solve today’s challenges. Mpho is also a strong advocate for girl & young women empowerement through mentoring and education, helping them become part of the STEAM and coding community she started and nurtures. Gerald is a primary school teacher currently working for Tiny Tots International School as a classroom practitioner and Cambridge Examinations Officer. He spent the past 13 years leveraging ICT to improve teaching and learning in Lesotho and Zimbabwe, integrating collaborative learning with the use of the Internet and new technologies. Gerald holds a Diploma in Education and he is an International Education and Resource Network certified Master Teacher (iEARN-USA). He also holds a Certificate of Mastery in e-learning from The World Links eLearning Program. A student at the National University of Lesotho studying B.Sc Information Systems, Maparisi will be graduating in 2018. She volunteered to be a lab assistant at the National University of Lesotho for CS1301 (Computer Awareness and Skills) course in the academic years 2016/17 (January to April) and 2017/18 (January to April). Most of the credits in the courses she pursued comprise of projects which involve developing and executing workable information systems, involving concrete exposure to practical cases. Maparisi spends a lot of time researching about the impact of technology on the younger generation; the effect of growing up in the "age of technology" on young people. She participated in Girls Coding Academy programming workshop held at Roma on March 2018. Prior to founding Girls Coding Academy with a goal to bridge the gender gap in the STEM field, Maneo studied Computer Science at the National University of Lesotho. Her first reason to encourage girls to learn coding? Because it's awesome! And if you need a second reason, here it is: learning coding help girls build foundations for lifelong skills that they can apply in any field of study and work. #Whatelse?